During the night, the River Baroness moved north to Rouen, a Salem-sized city in France’s Normandy region. In the morning, all of the passengers boarded buses for the two-hour ride to the D-Day Beaches. On the morning of 06 June 1944, the combined Allied forces (including not just the United States and England, but also Canada and France — and in the weeks following the initial landing, troops from Belgium, Czechoslovakia, Greece, and the Netherlands) assaulted German positions on five Normandy beaches spread over 50 miles of coastline. For many young Americans, the most notable depiction of this landing comes from Steven Spielberg’s Saving Private Ryan. 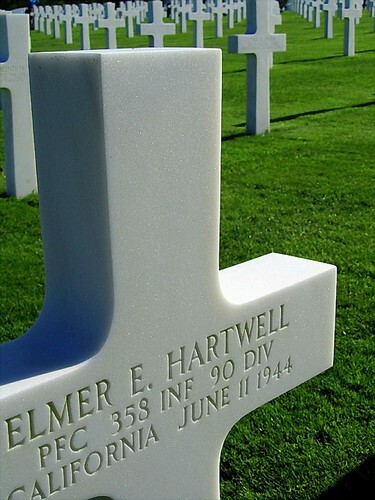 The Allied forces suffered about 10,000 casualties (including 2,500 American deaths) during the assault, and the German defenders experienced between 4,000 and 9,000 casualties. Over the next few months, these numbers grew significantly. Now the beaches (and a few surrounding areas) are designated as war memorials. Our group spent the day visiting Omaha Beach and the American Cemetery, with a side trip to view the Bayeux Tapestry. 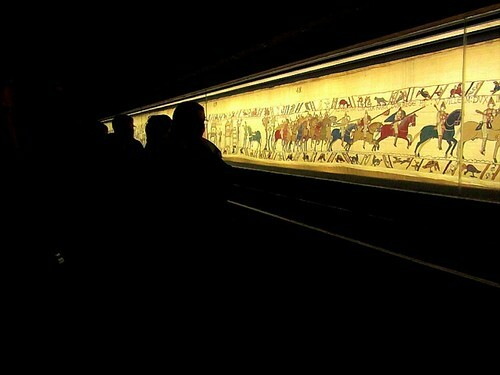 The Bayeux Tapestry isn’t actually a tapestry, it’s an embroidered cloth — though the difference is lost on me. Though its origins are unknown, many believe it was created during the 1070s, just ten years after the events it depicts. The 225-foot (68 meter) tapestry (or embroidery) illustrates the events leading up to the Norman conquest of England, including the Battle of Hastings. The individual scenes tell the story, which is spelled out in Latin along the border. Some geeks — and I’m one of them — consider the Bayeux Tapestry to be the first comic book. Because of this (and because Professor Nolley referred to the tapestry during our History of the English Language course at Willamette University), this has been on my “must-see” list for over twenty years. It did not disappoint. Even Kris, who had never heard of it before our trip, thought it was amazing. After visiting Omaha Beach and viewing the Bayeux Tapestry, we had about 75 minutes for lunch in the quaint village of Bayeux. No problem, right? Kris and I decided to have a proper sit-down meal. Big mistake. In France, restaurants don’t hurry their customers. In fact, much of what we take as customary in the U.S. is considered rude. As in Italy, you must ask for the bill; the server doesn’t just bring it to you. And meals all have a leisurely pace. Such was the case in the restaurant we chose. It didn’t help that the place was busy. Our simple lunch stretched on and on until we thought we might miss our bus! Fortunately, the waiter sped up the process when Kris explained the situation to him in broken French. After lunch, we visited the American Cemetery. The place was poignant, as expected, with a sea of white marble crosses. But we felt rushed. Plus, we wished we’d started in the interpretative center (which our local guide had warned us away from), which added depth and color to the experience. Security at the cemetery was very tight — tighter than even at the Louvre or Vatican. On the way back to the boat, the bus got stuck in traffic. Yet another French traffic accident. I know people complain that Italian drivers are wild, but we found French traffic to be much worse. 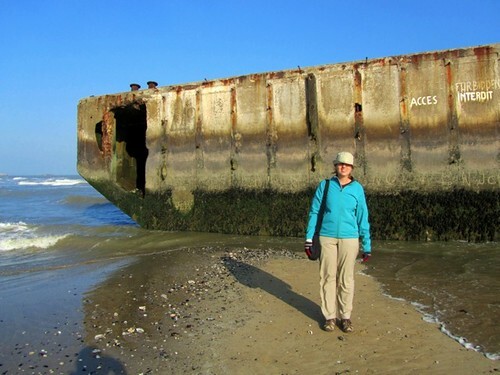 What is Kris standing in front of, a wrecked ship or a wall? This is my understanding of a embroidery or tapestry design. The embroidery floss is sewn on to an existing material to create a design. A tapestry design is woven by weaving colored threads or yarns to make a piece of cloth, making a design as you are making the cloth. Does that help, J. D.?